• Luxury connoisseurs and Seabourn loyalists interested in the brand's evolution. • Travelers seeking an abundance of onboard activities and elaborate entertainment. 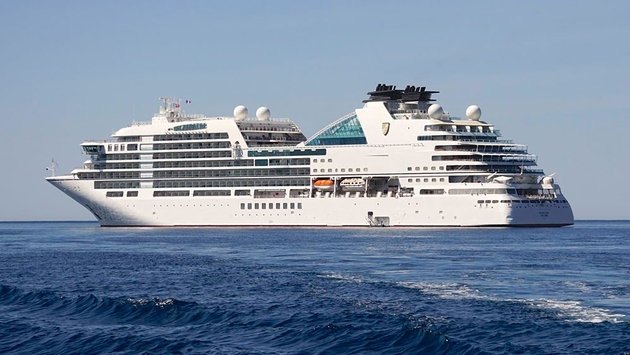 The Seabourn Encore will be very familiar to anyone who has previously sailed on one of Seabourn's Odyssey-class ships. It is mostly the same externally and structurally—save for an extra dining deck—but its interior design is a marked improvement since the Seabourn Quest. Hospitality designer Adam D. Tihany took an already great canvas and enhanced it with a timeless yacht-like decor, brightening classic spaces like the Observation Bar with a new skylight in the process. By making the ship larger overall and adding to its capacity, the passenger space ratio has actually reduced some since the Quest, technically resulting in less public area for each passenger. However, thanks to Tihany visually opening up venues like Seabourn Square—great as a reception area and library—and making more efficient use of space elsewhere, never does the ship feel any more crowded. In fact, the Seabourn Encore feels just as spacious if not more so. Accommodations are another area of improvement over the Quest. The Veranda Suite layout is mostly unchanged, but Tihany's aesthetic touches add richness while bed mattresses feel plusher this time around. Sheets barely cover the bedding and tend to pull up, however. Traditional trash bins would also be preferable to those with an unusually narrow opening. A huge plus is Seabourn added electrical outlets and placed a welcome one at the counter along the bed and one higher at the dining room table—also great for enjoying wonderful private room service. Meanwhile, Veranda Suite bathrooms are luxuriously appointed and stocked with lovely house Molton Brown toiletries. His and hers sinks are nice, as is a new elongated toilet. As before, however, the inclusion of both a bathtub and shower makes for a smaller latter enclosure that is just large enough but could definitely be bigger for a suite. Nonetheless, the high angle-mounted shower head is perfectly placed and features fantastic water pressure. The main benefit of a smaller ship is fewer people, but it also understandably results in fewer activities. Still, amenities are plenty sufficient, including the signature onboard marina for water activities enjoyed right off the ship in select destinations. Of course, the spa is another popular area for its many treatments and thermal area with sensory showers, sauna, steam room and tile loungers. If anything, it would have been nice to see a thalassotherapy pool as well. Nevertheless, there is still the main pool amidship as well as the auxiliary one overlooking the stern. There also remains a great whirlpool available at the bow and a new one as part of The Retreat. For an extra surcharge, guests can have a private al fresco cabana with exclusive access to the shaded deck area and water feature as well as concierge-served food and drink and additional spa services. One curiosity: There are very little views to the outside, even from those cabanas skirting the exterior of the ship. Rounding out activities are a few onboard shops, card room, casino and The Club for dancing. The Seabourn Quest was already a dining wonder, and the Seabourn Encore only elevates the experience further. Along for the ride are all the classic restaurants and eateries in addition to Sushi. The Grill by Thomas Keller more than doubled in capacity this time around. The main dining room, of course, remains fantastic as does its delivery via room service, and The Colonnade buffet has been wonderfully enhanced with a much more efficient layout and continued great cuisine. The new Sushi offers delicious bento box lunches and sashimi, rolls along with other fresh offerings for dinner—all of which are excellent and expertly prepared by Japanese chefs. It must be said that Thomas Keller's food onboard transcends the rest. His dishes can be enjoyed at The Restaurant, The Patio, The Colonnade and signature The Grill—where the best is reserved. This is the only place in the world where his exquisite cuisine is complimentary, and coveted reservations are required but indeed attainable. It truly is remarkable how astoundingly good his flavor profiles are, elevating even the most common courses. Seabourn has something very special onboard thanks to his incomparable talents. Due to size restrictions, the Grand Salon cannot present the most elaborate production shows, and that's alright. What the Seabourn Encore has wisely done is focus on what it can do. Showcasing a paired-down cast of four singers and two dancers—augmented with a solid audiovisual package and backed by a small orchestra—is the best way to get the most out of limited performances. The company is quite entertaining, and while nothing is to the scale of Broadway, resulting shows still outshine their predecessors. The highlight is "An Evening with Sir Tim Rice." It's a perfectly balanced example of simple stagecraft carried out to great effect. The lyricist's personal video introductions add interesting behind-the-scenes touches to each number that then resound live in the theater. By comparison, cabaret acts like violinists Laszlo and Claudia are more stale and would be better only musically without the attempt at contrived humor. Service is a hallmark of Seabourn, but its software on Encore honestly has some room to catch up to its excellent hardware. It's still in the top tier to be sure, and the crew were very attentive and friendly, whether greeting guests or serving ice cream. There were a few instances of service and maintenance that fell short, however, including several rust stains throughout and a rather mildewy shower already—surprising for such a new ship at the time of this review. Nonetheless, with only a few rough edges to iron out, the luxurious Encore is well on its way to being the flagship vessel of the Seabourn fleet.